WASHINGTON (WUSA9) -- The family of Ethan Saylor may be just a couple of hours away from a huge step towards justice in the death of the 26-year-old Frederick man with Down's Syndrome. Thursday, they will hand deliver a third of a million signatures on a petition to Governor Martin O'Malley, formally asking for an independent investigation into Ethan's death, plus training for law enforcement. 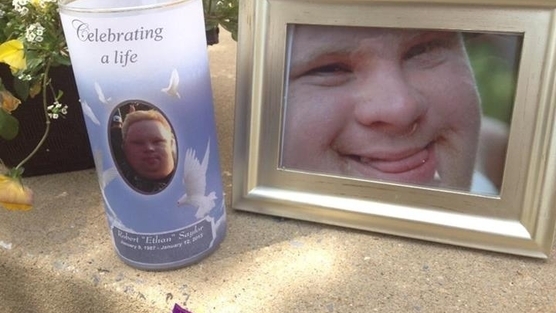 It has been 8 months since Ethan died in the custody of three Frederick County Sheriff's deputies who escorted him out of a movie theater in handcuffs for not having a $12 movie ticket. And for 8 months, Emma Saylor and her family have been fighting for justice. Emma never thought her change.org petition asking the Governor to intervene would grow worldwide, "Never... I thought maybe the max would be 2,000 and now I look at it, and I'm ....speechless." Since then, the petition has grown to 340,000 signatures. Emma says, "It's overwhelming, it makes us feel great as a family, it's like we're not alone." The family admits they've felt forgotten, cast aside, as if Ethan's death didn't matter, ever since the Frederick's County Sheriff's department investigated themselves and found the deputies clear of wrongdoing, even though the medical examiner ruled Ethan's death homicide by asphyxia. They have had support from Down Syndrome organizations, and some lawmakers, including Democratic Delegate Heather Mizeur, but to date, there's been no word from the Governor. Emma says she hopes the Governor hears all 340,000 voices, and grants an independent investigation, "It's so much bigger than Ethan, it affects everyone." WUSA9 has pressed for answers too. Despite several requests, we have not heard back from Frederick County Sherriff Chuck Jenkins, nor anyone from Governor O'Malley's office. There's another new development tonight, Ethan's mom Patti Saylor will be joining with the National Down Syndrome Society to hold a training webinar later this month for law enforcement and first responders on how to work with people with intellectual disabilities. It's free and anyone can join in.